Here is a super easy make for you for a gift for someone or to make for yourself. Using a sewing machine or you could even hand stich these just take a few little scraps of fabric, I used some floral and then just plain white felt for the backing. Cut out a little heart out of the patterned fabric and cut the backing slightly bigger to give it a little border. 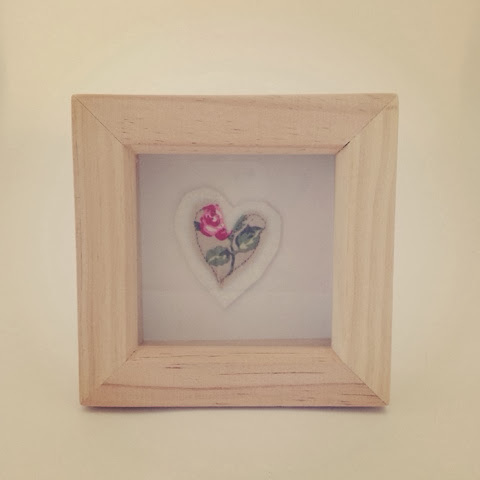 Sew them together on to some card and there you have it, a lovely little piece of artwork. I popped mine in a cute little box frame from The Range. Do share if you make any yourself, I would love to see you creations ! You could add wording to these too to make them even more personal.